BCDB Rating: 2.7/5 Stars from 5 users. This page has been viewed 34 times this month, and 4515 times total. Cartoon Characters: Tarzan, Zugor, Uto, Kago, Mama Gunda, Kala, Kerchak, Terk, Tantor, Tonka. Produced By Carolyn Bates, Leslie Hough, Jim Kammerud. Written By Jim Kammerud, Brian Smith, Bob Tzudiker, Noni White, Rhett Reese. Music: Mark Mancina, Phil Collins, Dave Metzger. Editor: Ron Price, John Royer. Originally Released in 2004 (Estimate). The story picks up immediately following the end of the story in Disney's 1999 animated theatrical release "Tarzan.". Do you have anything to add to this page? 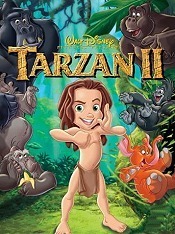 Have we made any mistakes... or do you have any additional information about Tarzan II? If so, we would love to hear from you. Please send us a quick note with your additions or corrections to this page, and we will make the corrections as soon as possible! 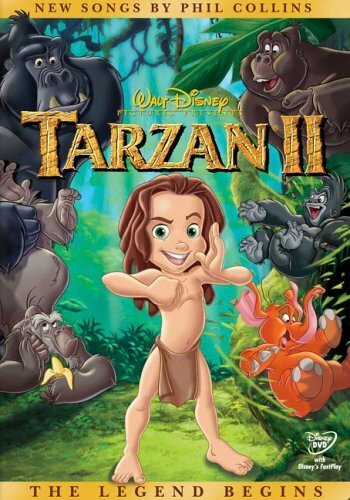 Do you love Tarzan II, or do you think it is the worst cartoon ever? Let us know what you think! Surely you have an opinion... so share what you think. Take a minute and post your own comments about this cartoon here. Tarzan II by Big Cartoon DataBase is licensed under a Creative Commons Attribution-NonCommercial-ShareAlike 4.0 International License.